Since we've wrapped up the month of May, I figured I'd do a quick sharing of a couple new items I acquired over the month. Glytone Mini Peel | Once I had a chance to try Glytone's glycolic acid cleanser, I immediately wanted to go back for more. My first instinct was to purchase something that would give me the biggest bang for my buck. If I had acne breakouts I would have grabbed the Glytone Acne Mask that Pharrell recommends. But, since discoloration is my biggest concern, I figured a mini peel that I could do at home would be the best option. I like that it's a gel (not liquid), which makes application much easier. This peel is quite gentle. I didn't experience any actual peeling. Maybe because I exfoliate regularly anyway. Even when I went in for a series of professional peels at a med spa, the peeling I experienced was little to none. I'm gonna do mini-peels 2-3X a week and hope for great results. 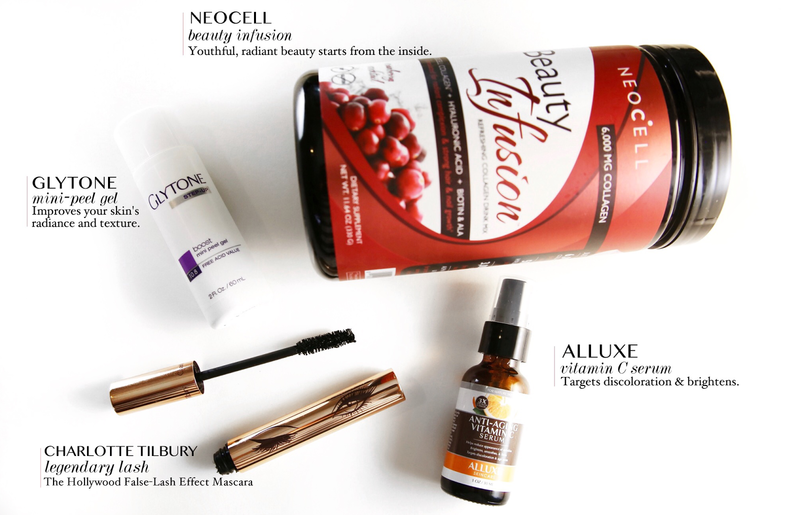 NeoCell Beauty Infusion | I'm a HUGE fan of NeoCell. When a rep from NeoCell reached out asking if I wanted to try one of their products, I was elated. So far, I've enjoyed their yummy collagen chews, supplements, and collagen powder. The rep was kind enough to give me the option of selecting any item from their lineup and decided to go with the Beauty Infusion powder. It's loaded with skin loving goodness and has a yummy cherry flavor. Beauty Fusion mixes smoothly with water which makes it easy to consume on those days when I'm not making a smoothie. I'm really looking forward to awesome results. Will give an update. Alluxe Vitamin C Serum | A spur of the moment purchase. I actually picked this up at the beauty section of TJ MAXX. My goals include having bright, even toned skin but I didn't have a vitamin C serum in the line up....that was not congruent so I had to rectify the situation. I grabbed this one because the vitamin C was blended with other healthy skin ingredients like hyaluronic acid, green tea, and loads of plant extracts. Charlotte Tilbury Legendary Lash Mascara | Another impulse buy. Youtube recommended that I watch video of make up artist Wayne Goss reviewing a newly launched mascara. On camera, he applied a couple of coats and his lashes transformed right before my very eyes. Wayne also deemed this product as "the holy grail of all mascaras"...and there was no mascara's that he's tried that outperformed this. One can never have enough mascaras so I bought it. I love my Japanese mascara, but honestly, it doesn't create overly dramatic results. My strategy was to grab this super-volume mascara and layer it with my Japanese one. I'm so glad I gave Legendary Lash a try because I love how well it works. This is truly a transformative product that brings dramatic results. Heroine Make is my every day mascara and Legendary Lash is my secret weapon. Do you actually buy all these products you always talk about or you are just advertising them for the affiliate link. it makes your blog sound like a beauty commercial. it's getting boring. used to enjoy your blog. Great question Anon! I buy 99.999% of the products I review. Companies email all the time but I mainly turn them down. But I honestly love NeoCell (I've always bought their products in the past) so I graciously accepted their offer. I talk about a lot of beauty products because I'm testing them out to help me with my troubled skin. So sorry that the topics aren't interesting to you. If you have suggestions for topics in the future, feel free to share 'cause I'm always looking for post ideas. I really like your Monday motivational posts too! Keep up the good work. I'm a self proclaimed product junkie, which is makes this blog the perfect outlet. The blog is nearly 10 years old and I can count, on one hand the number of times, I've accepted items from brands. I much prefer to buy stuff that I actually want to try for myself. I'd love to try out that Charlotte Tilbury's mascara. Nice post. I love your blog! I am a beauty junkie and I love all the product reviews you do. Even when it isn't something I'm into I read as I am sure one of my girlfriends will be. Keep up the great work and have you tried NeoStrata Skin Exfoliating Wash? I use this daily and it really helps with my discoloration especially around my mouth. Gracious response indeed. I love your blog (motivation Monday is my fav). But people like me rely on product junkies like you to let us know what might be worth looking into. So long as the opinions are your own, you're doing your readers a service. Nadege personally I love your blog. I've gotten so many great beauty tips from you. Keep up the good work. Btw your response was very classy which makes me want to support you even more. Stay encouraged and thank you for the wonderful beauty finds. Nadege I want to let you know that you are one of the few blogs I still read. I never feel like you are just promoting a product. You are out here in the beauty jungle with all of us trying to find the right balance of product and lifestlyle. Thank you for your honest answer and I hope your blog stays true to its core.